@prettipiratemama I haven't been able to. I tried a couple times to save my ultrasound picture and it didn't work. I'm on an Android. Is anyone planning on taking a babymoon (or if you're a STM+, have you taken one in the past)? We did a babymoon to Mexico for my first pregnancy (this was before zika). It was fine and fun, but for the second what I really wanted was to go on a vacation post nursing when I could truly appreciate the sleeping in, comfy hotel bed, DRINKS, and overall me-time. I nursed and pumped for about 7 months, so we left the kids with my in-laws for a four-day weekend when DS2 was about 10 months old. Best decision ever. We will do that again this time. This is such a great idea!! Celebrate the end of nursing with a getaway. Love it! This is a rhetorical question/more of a rant but why do companies think that making prenatal vitamins the size of horse pills is a good idea? I already have a sensitive gag reflex. Ugh. You know, some do prenatals in two pills a day (ironically I think the one-a-day company has one). I take a huge one because of fish oil dha. I took that one (those two?) for a while and liked it (one is the prenatal, one is the DHA component)! I mean, I'm not sure what I should like or hate in a prenatal, personally, but I had no ill effects. Right now I'm finishing off the One-A-Day prenatal that comes in the couples pack since we have a couple bottles of that still. Has anyone experienced light spotting? I’m 9w2d and every couple of days I have bright red or light pink when I wipe. Nothing gets on the underwear and it is always gone the next time I go to the bathroom. I read that some spotting is normal so I’m trying not to stress too much. A little bit of spotting the way you've described it is completely normal (albeit nerve wracking). If it gets heavier or more consistent definitely mention it to your doctor. And if it's accompanied by cramps that's when it can be really worrisome and your doctor would probably want to see you in the office. I had this. Mine is from a subchorionic hemotoma, basically a bleed that isn't related to the baby. That's not always the cause, but it can be. I've been on partial bed rest for two weeks now and go in tomorrow to see if it's gone. Baby has been fine the whole time thus far! Spotting can be from many other things too of course, and it's more common than people realize. I know (from personal experience) how hard this is, but try not to stress too much, and call your doctor if you want some reassurance or a scan to check on baby! Quite possibly round ligament pain. It can show up at your belly button and definitely is a sharp pain triggered by movement. It's usually listed as a second- and third-trimester symptom, but it is not uncommon earlier. If it is fairly fleeting, but chronically occurs with movement, that is a likely culprit. Thank you, @melanier26 and @steminist. I'll give it a little bit of time and see if it works itself out. It's difficult not to be worried about every little thing with pregnancy. Not baby related, but has anyone flown on American Airlines recently with a kid? Just booked flights but the way they do their seating now is awful, unless you want to pay $150 more per ticket, which would double the ticket price). Can't choose seating until 48 hours before the flight and for a fee. If you don't want to pay, they'll assign you seating and "attempt to put children under 15 with at least 1 parent." I'm nervous that they would assign us away from our 3 year old. Anyone had good or bad experience with this? @alinic916 haven’t experienced this directly but if they are crazy enough to seat your 3 yo alone, there is no way the other passengers will want to be seated next to him/her without a parent present. I guarantee someone will switch seats with you. @alinic916 In my experience they will always seat you with a toddler. When you check in and they see how young your child is they will bump someone else to put you together. If you check in online first and they've seated you separately, just go up to the counter as soon as you arrive so they can switch the seats for you. They will do it. @junebabyh Thanks! Hopefully it works out! @alinic916 I just flew United on basic economy with both kids by myself. We paid $15/seat after booking to make sure we were all together. I didn't want to chance it because I was alone, but we would have if all four of us were traveling together. This is such an effed up policy. I can't believe the airlines would want that liability. I can't imagine the case where they would seat you away from a child, and I'm SURE someone would switch you to accomodate if it came down to that. @alinic916 I have given up my seat multiple times to allow parents and kids sit together. It’s just what you do. When getting blood drawn the other day, I had a shot of nerve pain go down my arm. It really hurt, but quickly went away. The past week though I have little pinches of nerve pain up my arm randomly or if I reach for something. I’ve read some scary articles about it. Anyone else had this happen? I’m hoping it just resolves itself on its own in time. Hopefully there's enough people as kind as you if it's an issue! I’m 11 weeks today and the nausea is getting much better, thank God. The last few evenings have been bad though. I had a snack at 5 to hold me over until dinner but then when dinner rolled around I had to force myself to eat a bit of soup. Now, about 45 minutes later, I got hit with a feeling of “if I don’t get something in my mouth right now I’m going to gag and probably vomit”. I’m slowly snacking on crackers and water now which is helping the gagging feeling but not my stomach. I’m confused bc the bad nausea usually only hits when I have an empty stomach. Anyone else get moments like that? if they happen to not seat you together, just go to the attendants at the gate and they will move others to put you together. I just opened a bottle of the Nature's Bounty ones and I like them. I like the Olly prenatal ones better though. They're orange flavor. Didn't like the vitafusion ones. @obsessedwithoranges yeah I’m taking it/diclegis (same drug). I felt like a zombie for the first few days. I wouldn’t say I’m feeling normal now, but it’s better than when I started it. 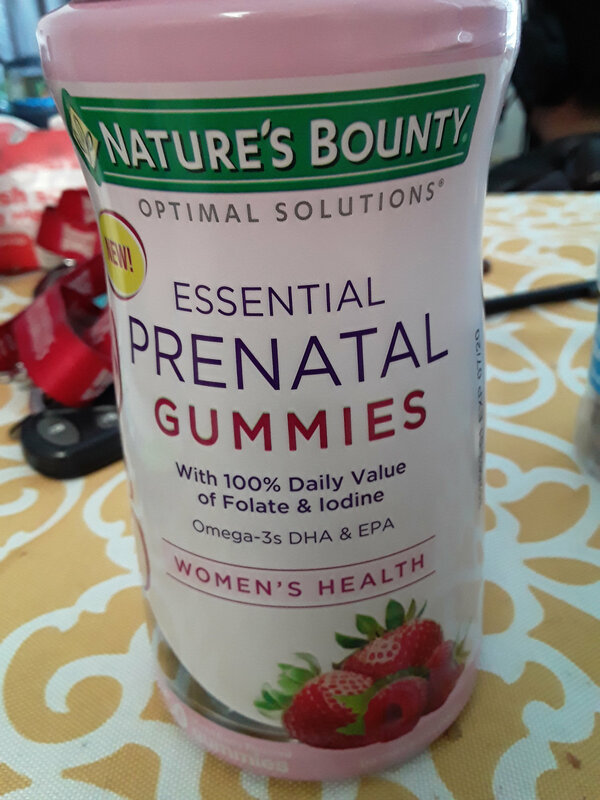 Going off of the prenatal vitamins comments, with my last 2 pregnancies I took rainbow light brand prenatals which were horse pills but they didn’t have dha so I had to take a separate vitamin (spectrum essentials prenatal dha). It was always hard to keep down and I felt even more nauseous after taking them. This time around, I have found just the target brand prenatal (the off brand one of the one a day) have been a lot easier to keep down and I haven’t been as sick from them. @greenbean-2 ok good to know. I didn’t have as much nausea today but also felt super drugged up all day. I’ll keep taking it if it gets better!